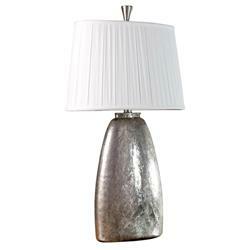 Combine antique silver and modern elegance and you end up with the lovely Vivian Glass Lamp. Featuring rounded glass finished in an antique silver, the Vivian flaunts a slightly textured appearance that contributes to the interest of the piece. Contrasted by a gently pleated, off-white lampshade, the Vivian creates the illusion of a metallic lamp, making for a lighting option that is sure to stand out in any interior.